laura doodles: Inspiration Post: Mouthwatering Mac & Cheese!! Inspiration Post: Mouthwatering Mac & Cheese!! Hey everyone!! I've missed way more "Inspiration Post," than I'm proud of but I'm going to pretend I didn't and moved onto July 2014's post. The "Inspiration Post," is the reader's chance to check out at what peaks MY artistic interest and motivates me to create such crazy imaginative illustrations!! There are so many things that inspire me it's always difficult to pick just one theme. After much deliberation I decided to choose "Mouthwatering Mac & Cheese!!" Nothing beats a hot bowl of super cheesy and savory Mac and Cheese. I love Mac and Cheese like nobody's business. If I could I would make and eat it everyday of my life. In fact, I've featured a classic as well as more wacky recipe for mac and cheese on my blog before. Digging further back into my history you will even discover an early illustration I created as an ode to my love for the comforting noodle dish. So grab a piping hot bowl, sit back and let me be your guide through "Mouthwatering Mac & Cheese," heaven!! Since this is an illustration blog, I decided to start things off with an adorable Mac & Cheese illustration. A little elbow noodle embraces his best pal CHEESE! Talk about comforting comfort food!! The simplistic use of color and shapes make this illustration a winner in my book!! Designed by Meghan Murphy this piece even made it's way to Shirt WOOT! in their comfort foods derby. No lie, I'd rock this apparel design in a heartbeat! It's amazing what you can find on Etsy with just one simple keyword. I dug up this super creative handcrafted soap in the SoapsationalFavors etsy shop on my quest for Mac & Cheese goodness! I applaud the creativity that went into even fathoming this comfort-food cleanser. And it looks so realistic I'm half tempted to eat it. Thankfully the artisan labels the final packaging with "glycerine soap" on the back to avoid and incidental digestions! because I would more than likely just dig in. SoapsationalFavors offers all kinds of unique soaps so check them out on Etsy!! I love me a good textile print!! Check out this delicious fabric by the "Timeless Treasures" company! The print features different little individual dishes of Mac & Cheese crafted with a variety of noodles. The photographically realistic casseroles stand out on a contrasting black background. Just think of the possibilities you could sew with this beauty!! Although I find it highly unlikely I would ever be able to craft anything with this WITHOUT drooling all over my project. Holy Macaroni Batman! Last but not least is an ad featuring my favorite caped crusader, Batman! But not just any ad, a Kraft Mac and cheese ad that dates back to the late 90s. 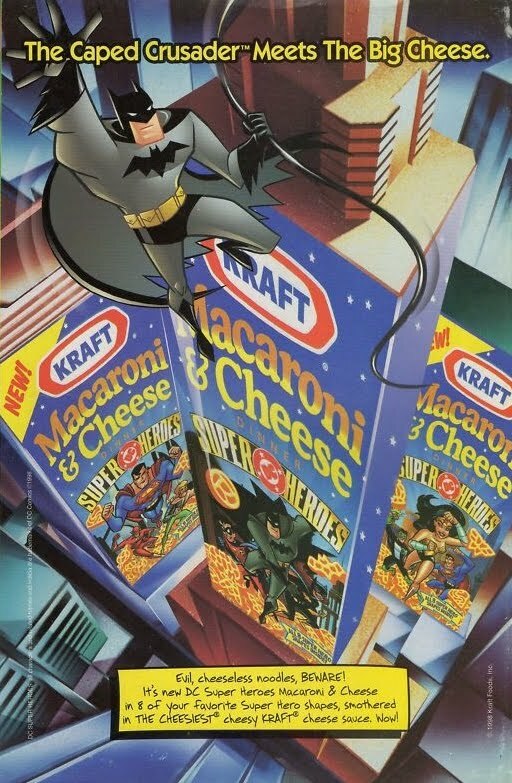 This ad combines 2 of my most favorite things; Mac and Cheese AND Batman. I can't say that I taste tested this back in the day but I'm sure it was delicious. The signature Kraft Dinner boxes tower over gotham city like skyscrapers. How clever! I also dig the tagline. "Big Cheese," get it?! Oh puns! Drooling for more?? Check out my Pinterest board titled "Inspiration" for bonus pieces that didn't quite make my 5 piece limit per post. And who knows, maybe NEXT month's theme might already be in mixed in there! Follow http://www.pinterest.com/nerdycupcakes/inspirations/ and stay inspired every month with lots of goodies to keep you from creative constipation! Have a super week everyone!! I always learn something new on your blog! So glad you're back!!! I missed you and your charming blog posts!! !